WHERE THE VEEP CANDIDATES STAND ON CLIMATE AND ENERGY | "Global Possibilities"
The Tuesday vice presidential debate may not get as much attention as the main show, but the rivals are nearly as polarized on the issues — especially when it comes to climate and energy. In his 2012 gubernatorial campaign, Pence received at least $850,000 from the energy sector, including $95,000 from coal magnate Robert Murray and $300,00 from David Koch. The friend of fossil fuels has also said that Trump will “end the war on coal,” and opposes President Obama’s signature environmental legislation, the Clean Power Plan. Indiana, the nation’s eighth largest coal producer, is one of 29 states currently fighting the legislation in court. In 2014, Pence overturned an energy efficiency program enacted by his Republican predecessor, despite that fact that the Indiana Public Utility Commission estimated the program would create more than 18,600 jobs. That same year, Indiana ranked second among all states for industrial greenhouse gas emissions. While in Congress, Pence also voted to bar the Environmental Protection Agency from regulating greenhouse gases, and voted in favor of opening the Atlantic to offshore oil drilling. In fact, he voted against nearly every piece of environmental legislation during his 12 years in Congress, earning a lifetime score of 4 percent by the League of Conservation Voters (LCV). Kaine supports the Clean Power Plan and introduced a budget amendment to help the Department of Defense prepare for climate change. The avid outdoorsman and conservationist has a lifetime score for 91 percent by the LCV. He was an early opponent of the Keystone XL Pipeline, coming out against it in 2013. During his tenure as governor, however, Kaine’s administration approved plans for a 668-megawatt coal plant in southwest Virginia. He’s also been in favor of offshore drilling in the Atlantic (although that changed after he joined the Clinton ticket). Kaine says he views natural gas a “bridge fuel,” and — despite his opposition to Keystone — penned an an op-ed referring to himself as a “pro-pipeline senator.” According to ClimateWire’s Emily Holden, he supported fracking in national forests as governor, and he voted to fast-track natural gas export terminals. Yet he’s endorsed the goal of transitioning the U.S. to 25 percent renewable energy by 2025, and Kaine protected 400,000 acres of land from development and worked to help coastal communities prepare for climate change. If history is any indication, climate change won’t get much attention in Tuesday’s debate — in all presidential and vice presidential debates in the past five election seasons, climate change had a grand total of 37 minutes and 6 seconds. If it were up to us, we’d want to hear a lot more about Pence’s recent comments on human-made climate change. 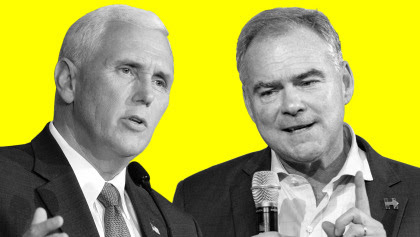 Hearing from Pence and Kaine for a few minutes on climate would hardly be the most shocking turn of this election. After all, we’ve been surprised before.